Home > Questions > Should I treat by anti-wrinkle ‘areas’ or ‘units’? I’m going to go out on a limb and say, from someone who injects anti-wrinkle injection day in, day out, you should NEVER, NEVER, NEVER pay for anti-wrinkle ‘areas’. I have been a cosmetic injector for over 8 years and have spent my time perfecting the art of anti-wrinkle treatment. I love it and have stopped GP work to pursue this art. Over the years, I usually get my frown and forehead treated and have tried 10 units, 15 units, 20 units and 25 units in my frown. Let me tell you – from personal experience 25 units lasts longer than 20 units. 20 units lasts longer than 15 and so on. It is still the same treatment ‘area’ but using different units makes the product last longer or shorter. Treating my frown with 10 units lasts about 6 weeks. Treating with 25 units lasts 4 months. It is still the same treatment ‘area’. If I was paying at a clinic that charged per area I would pay the same for 25 units as 10 units. I would have to trust the clinic that they were using the right amount of units for my needs. The cosmetic industry can be a bit confusing to navigate. At Cityskin, we are firm believers in transparency to our patients. Our consultations will cover what product we use, the benefits of different brands and how many units or mls are used. If we simply treat ‘an area’, this information can get muddled and it might be difficult to know what you actually received. Make sure you ask your practitioner, and empower yourself with the knowledge of what you’re getting for your money. To ensure transparency make you ask your clinic for your treatment notes. Do some homework and see how much you are actually paying per unit for your treatment. 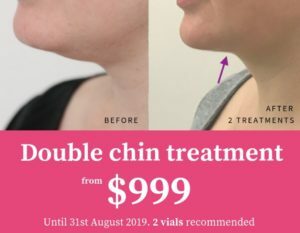 If you have your forehead ‘area’ treated for $195 and you had 7 units you have paid almost $28 per unit to have your forehead treatment. Facial slimming – 20 – 30 units each side = 40 – 60 units in total. We charge $550 for 50 units at Cityskin. Use this as a guide when you have your next treatment. You also need to take into account the brand of product that you are using. The above units are using the most common anti-wrinkle brand used in Australia. The unit guide shows that the amount you need and the cost for each area varies widely from a weak frown ($144) to a strong frown (25 units = $300). Why has my treatment area worn off quicker than expected? You didn’t have enough units to reduce the lines sufficiently. If you have a strong frown it probably needs 25 units to reduce it. Don’t use less as it just won’t work well enough. The anti-wrinkle brand was diluted too much. At Cityskin we use the 2 main brands available in Australia. We choose to make one of them stronger than it should be. Think of this as having strong Ribena rather than normal.strength Ribena. Always ask which brand you are having and how much it has been diluted. The video below shows how we have to dilute a vial of anti-wrinkle product. Clinics can vary how strong they make their product. The product wasn’t placed in the right area. Make sure you are being treated by someone with experience. Be honest with expectation. I find some movement returning after just over 2 months but it is very subtle and full movement is around the 4 month mark. It is normal to have a very small amount of movement after a couple of months. In this video I show you how we dilute all anti-wrinkle products. Check with your clinic to see if they are doing this correctly!